It is the first of November and time to move on again. We've seen the sights of Granada and done all the shopping we needed to do. Even if we had of wanted to spend more time here, we would have had to find alternative accommodation: the campsite is closing for the season as well. Off we head towards Cartagena near the coast. We think it will take us five cycling days to get to Dénia, just north of Alicante, to visit Sanne's mum - Catja - and pick up a parcel with some well needed equipment. As early as our bodies will allow us, we get up along with most of the other campsite residents, pack all our belongings and hit the streets of Granada. The public holiday makes it a very calm ride towards the Sierra Nevada outskirts. It is stunning. Again the jagged limestone cliff faces jut high into the sky. Later on in the day, these turn to rich red coloured sand, making the vista like any gorge in the middle of Australia. Our goal is to try and get to Baza today and look for a nearby campsite. According to the map there aren't any, so there's a chance we'll have to camp wild. It is quite a beautiful day and the sun shines every now and again. Autumn has arrived in the Sierra Nevada and it makes a pretty picture with golden leafy trees against the steep mountain slopes. Another fabulous cycling day and to prove it, we meet and are passed by more than a hundred cyclists. The friendly greetings make the climb to Puerto Los Blancaris [1297m] a little easier. We sail down to La Peza to find people living in caves and the beginning of the highway we need to take to Baza. There's only one road into Baza: no alternatives. That normally means we can cycle on the highway, but not this time though! The signs are quite clear: no bicycles allowed. However, the thought of an enormous detour plus only a few hours left of riding time means we decide to break the rules. We pedal as fast as we can and surprisingly encounter not a single police car. A week later, we hear that all the boys in blue were at the cemeteries in Spain. It is All Saints Day, a holiday time when every family visits their deceased relatives. This at least answered my question about why everyone was walking around Granada with flowers and bouquets the day before. At one stage along the highway, we spot a parallel service road and after seeing another cyclist in the distance, we think we should try our luck with it. Unfortunately, we end up behind a completely fenced off hotel and in the middle of a freshly ploughed clay field. After debating the options - all difficult - I find a spot in the wire fence where others, obviously in the same situation, had made their crossing back onto the highway. We weight the fence down with a cement brick conveniently left behind by the roadside workers and with Ali on one side and me on the other we manage to lift our bikes, fully laden over and back onto the highway. Precious time wasted with the detour, we cycle like a couple of maniacs until it starts to get dark. We take the exit to Parc Natural Sierra de Baza (95km; 1458m) and discover a break in the fence just before a few trees big enough to camouflage our whereabouts. It is a farmers field, but we leave it just as we found it, after a very light sleep the next day. It is a 10 kilometre dash into Baza. Just as we enter the town at 8.30am we see our first police car heading in the other direction. They are probably still wondering where the couple of cyclists came from at that time in the morning with only one road into town. Before lunch, the scenery turns from rolling hills into masses of construction sites; nearly all of them half finished. An equivalent amount of trucks servicing the granite, marble and building industry in this area continually whiz past us, but then left just before Pulpi. A new landscape greets us as we come over the hill: brightly clothed workers are easily distinguishable against the hundreds of rows of vibrant green lettuce. This continues on for kilometres and we are greeted with waves, smiles and warm hellos from the Moroccans busy planting and harvesting in the fields. Fruit and vegetables remain in view for the next few days and it shows the extent of the industry here in Spain. The last few kilometres are difficult as the rain starts again and we stop at the touristy town of San Juan De Los Terreros complete with its flashy neon signs to pick up a few supplies. We awake and the winds are still going strong, but we have to leave today to make Dénia by Tuesday. We have already cancelled this arrival a couple of times with Catja. We are also hoping to get to Valencia by the following weekend to get our Sony camera looked at. It is a long battle the whole day against the bluster and our plan to reach Cartegena falls short. Reaching Isla Plana at 3.30pm, with a mountain lying before us, we decide it is best to stop here. The views have been close to dismal. Apart from a mostly grey and overcast sky, we take an "Ali shortcut" and end up on a deserted and very eerie vegetable farm. These detours usually lead us up giant hills or into unexcavated bush land and today is no different. But the mud roads are not half as shocking as the poverty stricken area. 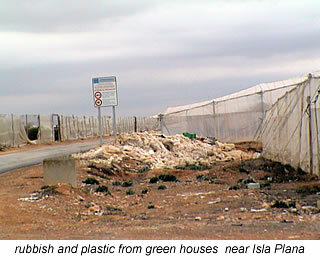 Shredded plastic from the empty grow-houses is blown over the entire landscape. Everyday rubbish is turned back into the soil. A few ramshackle buildings, not fit for animals to live in, dot the landscape. They are padlocked with rusty chains and washing blows in the wind. It is obvious someone lives here. A few lonely souls wander around picking up the discarded, rotting vegetables while seagulls feast on what's left behind. We both feel very sad. The shortcut turned out to be a total hoax and not the first time that our Michelin map has let us down. After an hour and a quarter of pushing the bike through clay, rocks, over water pipes and rubbish, we head back to the highway and find a campground at Isla Plana (70km; 863m) where we re-plan our route. We do get up at six-thirty and we are going for a 110 km ride. It is, however, totally overcast, still dark and very windy. The climb out of Isla Plana is short, incredibly steep with 14% gradients in parts. After 5 km, we finally reach the 310 metre peak La Torre De Nicolas Perez, not without stopping halfway up because I have cramp in my upper thigh. I run around like a mad chook, stretching, oohing and aahing until it disappears. The stormy headwind is full in our faces as is the rain. Life is hell trying to get up the last stretch. From the top, we can't see a thing except a valley shrouded with low lying storm clouds. With 7 long hours of arduous riding against the wind, we take in copious amounts today: a couple of packets of museli bars, cheese and capsicum baguettes, four apples, 6 litres of water and ice tea. The landscape is a little more distinguishable as we ride along it, but mostly made up of plastic green houses. Artichoke farms are also becoming increasingly present. The rubbish still lines the roadside. Just before arriving in Santa Pola (112km; 686m), a flock of rose colored flamingos fly along side reminding us that there is also beauty in the world. I would like to tell you that today the gales have subsided, but they haven't. We leave in the same squalor just as every other day this week. I can't remember much over the 120 kilometre ride, except that I am pep-talking myself all the way. We climb 937 altitude metres in total today and halfway up the climb before Altea, the wind dies down. Unfortunately, it starts to rain and doesn't let up until just before Dénia. Riding down the hill from Benissa is difficult in these conditions, brakes aren't working and for some reason my gears are slipping too. We make it to Catja's doorstep right in the centre of Dénia (121km; 937m) just as it is getting dark. Her big warm smile cheers us up immediately and we enjoy a wonderful evening chatting with her and her partner Robert until way past our normal bedtime. Tonight is the first real bed we have slept in since we left Arnhem, which was 103 days ago. Today, we ride an easy 90 km or so and camp just outside Valencia. The sun shines the whole day long and there is little or no breeze. Like the appreciated change in weather, the transformation in the scenery is also a welcome sight. We are surrounded by orange trees overloaded with fruit: ripe and ready for picking. Narrow, winding and incredibly quiet farm lanes lead us in and out of small townships and up to National Parc-land with acres of rice paddies, abundant with wildlife. Upon arrival at Devesa Gardens Campground, Ali is greeted with a sour "The camping doesn't open until 4pm". It is 3pm. A price list is pointed to with the added: "Here's the price list. It will cost 27 euros per night." After commenting on the rather large price tag for pitching a tent and resting two bikes, Ali asked if there are any other camping sites further on. The receptionist, who had no intention of letting us stay nor of helping us out said she didn't really know. Surely if you work in the tourism industry in anyway and certainly if you work at a campground, then you will be familiar with the competition business in the surrounding area. We discover that there are three campgrounds all within 500m of one and other about 5 km up the coast in Pinedo (87km; 71m). You can't tell me that she didn't know that. Anyway, we take the first one with a gate open and reluctantly agree to the outrageous 22 euros per night fee. By this time it is 4pm, Friday afternoon and Ali still needs to get our camera to the Sony Service Centre in Valencia and ride back out again before it got too dark. Roadwork means no other option than to use the main highway. Surprisingly, he was in and out like a speeding bullet. I sometimes forget he is Superman. He has both good and bad news. Firstly, Sony aren't going to pay a cent towards fixing the camera. The customer service from this company leaves a lot to be desired and it is a shame that nearly all our electronic equipment is from them. On the other hand, the initial quote of 150 euros for a complete new lens has come down to 40 or 50 euros for a clean. This seems a little peculiar, since the technician in Granada had said that there was no way of doing this. According to him, it was a completely closed unit. Lastly, due to all the rice paddies in the area, we were stuck in a mosquito infested area until Monday at the earliest. We had already decided that we would move to another campground the next day and although the number of mosquitoes doesn't decrease, the price of the pitch does quite considerably. That is some consolation. The facilities are just as ramshackle as ever and apart from our glorious stay in Dénia, we have almost forgotten what it is to actually sit on a toilet seat or walk barefoot on bathroom tiles. The couple of rest days and beautiful weather are put to good use though. A gigantic wash, thorough clean and rust treatment for our bikes, as well as carrying out the normal maintenance stuff. Monday comes around quickly and we arrive at 10am at the service centre to pick up the camera. It isn't ready and we are asked to come back at 1pm. Luckily the evening before, we had changed our initial plan of packing up and arriving at 9am to pick up the camera and then speeding on out of Valencia to our next destination. We decided it would be nice to spend the day riding around and seeing the sights, do some interneting and ring the Thermarest representative in Madrid. The previous night, Ali's mattress got a bubble in it. Just when you think you've got everything under control, something else decides to break down. We have been talking seriously about finding another alternative to our Thermarest mattresses, but Richard at Prowind is so helpful and arranges a replacement without any bother that we began planning our next leg of the trip around getting into Barcelona before Siesta on the following Friday. We return to the shop to find our camera waiting for us with an even smaller service fee of 22 euros and an explanation that it is the best job they could do. There is still a tiny dust bunny in the bottom left hand corner which can't be removed. It isn't that noticeable, so we thank them for their help and also for pushing us forward on their waiting list. Normally, we would have had to wait 15 days. We also ask how we can prevent this from happening again but apparently there is nothing you can do. So, the Sony cybershot camera gets a couple of minus points from us. Valencia itself is a modern, very clean and architecturally interesting place to visit. The dried-up riverbed of the Turia River has been transformed into a well maintained park with a network of foot and bike paths leading you right around the city. It was fantastic for cycling and we coasted along in the sunshine, sat at a cafe and enjoyed a beer while admiring the amazing structural forms of the Ciudad de las Artes [City of the Arts]. After shopping in one of the largest Carrefour's I've ever stepped foot in, we take our lives in our hands again and cycle back along the highway to our campsite. The next day, we don't dare venture out of the tent with bare arms or legs. Besides being really cold, the mosquito's are out in force. And I thought mosquito's couldn't survive in the cold. How wrong was I? As soon as the sun peaked over the horizon though, the warmth furnaces in and it was glorious. After a short stretch on the CV6400, which is considerably quiet for an early morning highway and a never-ending ride out of town, we find ourselves again amid the oranges groves. We follow an old favourite route: the N340 for much of the way until Nules and then we finally have the chance to use smaller roads and surprisingly enough some freshly built cycle paths. Since Dénia, the roadsides are freer from rubbish, the towns are rather spruced up and in general, there's a friendlier, more welcoming air about the places we are visiting. Following the signposts to Azahar Campsite at Benicásim (98km; 214m), we are not disappointed with what we find . Immaculately clean amenities, with hot and cold running water, reasonably priced pitches and a very friendly and rather mad Englishman to greet us at reception. We take a quiet walk along the beachfront in the evening and are overwhelmed by the majestic villas lining the boulevard; the type you see in movies like Gone with the Wind. It is time for bed reasonably early: not just in preparation for the 130 cycling kilometres of N340 but because it is getting down to beanie - muts for the Dutch readers - wearing weather. Not much to say about the trip from Benicásim to L'Ametlla de Mar, except that using the highways means you can cover quite a number of kilometres in a relatively short space of time. But it's absolutely no fun! By 12 midday, I am already irritated by the constant traffic flow. We pull off the highway, into a construction zone because it was way past refueling time. Up until then however, there had been nowhere to stop. Just before stopping at a service station later on in the day for refreshments, a young lad decides it will be fun to pull out onto the highway in front of us, causing us to brake harder than is comfortable on a couple of loaded bikes. The reason I say he thinks it "will be fun" is that he laughs at us the whole time while doing this. What is that all about? Another strange occurrence today is when we arrive at a service station for refreshments in the late afternoon. As I am heading towards the refrigerator to get a couple of cans of Nestea out, another customer pulls in and the attendant goes to serve him. Fair enough, I think. I grab the usual and go to the counter to wait. I am still standing there 10 minutes later. The attendant has walked right up to the shop entrance on two occasions, seen me, ignored me outright and turned around to serve newly arriving customers. I wait a bit longer, but am fairly fed up by now and decide to leave. Ali suggests that I take the cans over to him and try and pay that way. Why not, I figure? But again, I am met with a total lack of interest. "Un momento, Un momento" is all he can mumble, along with something about the cans needing to be scanned in at the cash register. He begrudgingly leaves his conversation, walks over to the register, takes my money and adds something about lack of respect. This is not the first time that I have got the impression that local shop owners are not too concerned whether you step into their business or not. On a much nicer note, we meet Oliver: one of the happiest cyclists we have ever met. His load is one of the biggest we have seen in a while too. He is obviously keen to chat as he makes a bee-line for us. We are cycling down into L'Ametlla de Mar and he is on his way out and on an undetermined amount of time cycle trip. He immediately struck me as being very bubbly and positively alive and when the conversation turns to a heart attack he had had four years ago, I am dumbfounded. To see this man now, you wouldn't have known it. And it demonstrates the amazing courage some people have to turn their situation around. We coast into L'Ametlla de Mar (134km; 757m), find the Spar supermarket with a convenient bakery next door. After buying supplies we thought we would ask at the very nearby tourism office about the exact position of campgrounds in the area. We are directed towards the closest: Nautic, which considering the tourist information office sent us there, is very surprisingly closed down for the season. Venturing a further 2 kilometres out of town, we reach Village Platje in a very much alive fishing port. It is another highway undertaking with over a hundred kilometres of continual trucks, cars, buses and anything else that moves faster than us. We enter Tarragona and very nearly don't get out again. Spanish signposting almost exclusively sends you towards the main highways. As the German cyclist, that we meet later that afternoon, says: "Spanish roads are only made for cars." Occasionally, there is a side road or esplanade to take us away from the main thoroughfare, but then we have to face potholes and the incessant use of speed humps. We enter and leave ghost towns with bars and restaurants firmly shut up for the winter: Molly Malone's; De Vuurtoren (The Lighthouse); Mucky Duck; Broodje van Kootje (Kootje's Burgers) to name a few. We also pass campsite after campsite: all closed. Our sights are set on Sitges, but darkness is descending. A huge billboard advertising Villanova Park leads us up the steep hill towards a very large and expensive campsite at Vilanova i la Geltrú (107km; 575m). The woman at reception speaks fluent Dutch, which is a pleasant surprise. Our arrival seems to have brought on a few raindrops as well and the campers in our vicinity point the finger at us, asking if we had ordered the rain or not. I am beginning to wonder the same thing. One Dutchman tells Ali that he was a roadie for Dire Straits for four years. Strange the diversity of people you meet in a campground. Anyway, he sympathized with us being out there on the highways and in his exact words says: "there's no room for cyclists on Spanish roads". Yes, we know. Luckily, the rain amounted to nothing more than a few drops and besides, it was the first we'd had in ages and after the full-on highway assault, we were affected little by what was happening after we fell asleep. After such a spell of great weather, we awake to disappointing skies: grey and overcast. Starting off on the N340 before taking the C31 along the coast, it rains for the practically the entire journey into Barcelona. Just before the outskirts of the city it lets up, though trucks made well and truly sure we remain wet. The coastal road is narrow, winding and fairly steep with absolutely no shoulder in parts and a railing no higher than my knee. Sheer drop views and a crumbling road surface make it pretty scary cycling. Adding to the adventure is the rain and steep inclines. A couple of cement factories are en route, which accounts for the amount of trucks on the highway. On a sunny day, with less traffic, it would be a dream ride. A quick food-fuel stop at a service station recharges us for the journey into the city centre and hopefully in enough time to swap our Thermarest mattress with a new one. We cycled this very same route 2½ years ago and are interested to see how it has developed. We needn't have expected too much, because nothing had changed. Literally, the same roadwork's are still going on with the same detours and even the same barriers in place. It looks as if they have hardly made any progress at all and it feels like we are in the middle of one huge construction site. Despite this and the maniacal driving antics on the way in, Barcelona itself is a wonderfully, exciting city with something to offer for everyone, including the loaded cyclist. Of course there are all the tourist spots and Gaudi's architectural madness waiting to impress you, but just wandering around the small streets and plazas bubbling with life, is also enough to keep anyone occupied for a couple of days. Better still you can easily cycle your way around. It is actually, the best way to get through traffic. Besides this, there are plenty of cycle paths even though they can end abruptly and you may be left in the middle of an intersection and wondering which way to go next. We get to the GR Zero shop 5 minutes after it closed for siesta (1.30-5.30pm). It had taken us a good 2 hours to get from the south through to the other side of the city. Luckily an employee enters just as we were cursing the annoying opening hours in Spain and he gets the owner Angel for us. The shop is full of rock climbing and camping goodies, so we go back the next day to purchase a new rain jacket for me. The old Marmot Goretex coat I bought in the US, 12 years ago is not keeping the rain out anymore. I really should have replaced it before I left, but I was sold a bottle of spray that promised to reproof my ol' favourite. Sure it did, for about 4 rainstorms, but then no more. I bought another Marmot but this time with Precip technology. It is half the price of a Goretex jacket, though it promises to do the job: It is apparently breathable, waterproof and a great wind stopper as well as coming in funky colours . I chose the yellow-lime green one, so you can now see me coming from a mile away. With a new Thermarest in hand, we head south out of town towards El Masnou (84km; 510m). Last time we had to jump a fence and follow the train tracks. This time we take a pedestrian underpass and go inland a bit. We come across an annoying detour but manage our way back to the coastal road and the bike path that takes us nearly all the way to the campsite (15 kilometres south of the city centre). The next day we realise that there's now a cyclepath for the complete journey into Barcelona and the beachfront and marina are lined with spanking new roads and apartment buildings. No shops are open near the campsite except a tiny store run by an Indian chap where we buy a few things to eat that evening. We find a nice spot on an upper tier to pitch the tent and then start with cleaning off the mud which now covers every inch of the bikes, bags and ourselves. Robin; a worldly and totally relaxed guy from Cambridge spends the late afternoon and evening chatting with us about basically everything and anything. Tomorrow he's off to catch the ferry to Ibiza and then on to Malaga via Dénia to meet up with a group heading on into Africa. We wave him off as he leaves, backpacked to the hilt and on his old fold-up bike, that'll probably remain in Africa. We both smile at the independence this guy has created for himself. It certainly would be a buzz to meet Robin again somewhere in the world. 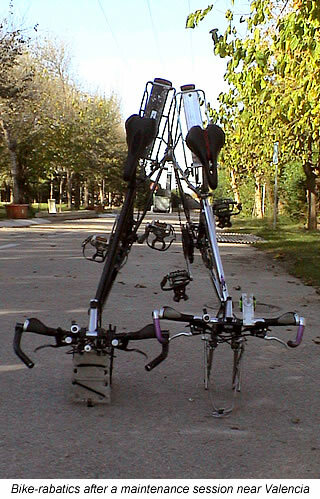 Spending the day in Barcelona, we track down a few bike bits and a new back rack for me. The well stocked Bike-Tech sells Tubus racks and plenty of good quality spare parts and we soon learn that it's run by a Dutchman. So after a nice chat with him, siesta is upon us and there is nothing left to do but head back out to our tent and prepare for the next day. We have already travelled this bit of the coast and our memories are jogged constantly as we gaze out over the cliffs at the beautiful blue-green ocean. The day is warm and gorgeously sunny at 23° C, but not quite as hot as we remember our last cycling trip. Back in the Summer of 2004, we had to stop at every shady opportunity to take in water and recuperate. Today however, it is an energetic, but easy climb up and down the hills. Later on, we pass through the touristy zones of Lloret and Tossa de Mar with still enough tourists to keep them alive at this time of year. In the height of season though, these streets are bound to be full of heineken-swillers, even at 10am in the morning. The beaches around the Costa Brava might be exceptionally beautiful, but these areas are not really my cup of tea as a holiday destination. It is Sunday and we are pleasantly surprised to find a Dia% store open in a small town just before our destination Platje d'Aro/Sant Antonio de Calogne (98km; 934m). The restaurants are filled and bubbling with chatter. It seems as though everyone in the region has ventured here today for some reason. We cycle on a bit further to arrive at an inexpensive, amazingly clean and tidy campsite with heated toilet amenities, hot and cold running water, plugs available at every sink and a little robin red breast that boldly hung around our tent and befriended us for our stay. It was such a pleasant environment we took a rest day along with some electricity to do some writing and repair the wobble in my front hub. The temperature has dropped significantly lately and apart from cooking time, we spend most nights sitting in the tent. During the trip from Calogne to Capmany, we have the chance to take some secondary roads where Spain is a much more pleasant place to cycle. The closer we get to the Pyrenees, the greener it becomes. We dart along small and picturesque country lanes; we pass through Figueres, where we camped last holiday and visited the Dali Museum. 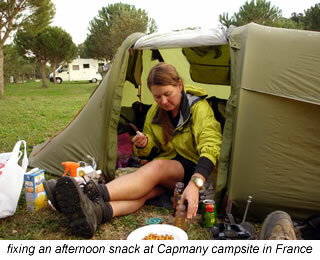 Today however, we only stop to shop at the Intermarche for supplies before coasting out of town to find the campsite in the village of Capmany (85km;510m). Autumn colours surround us and we take a quick break next to some fields alive with bird activity. A half hour later it's threatening rain, but we only receive a light drizzle. Stopping to ask for directions to the campsite, a road worker babbles away in very fast Spanish. He first directs us around the village and then corrects himself and points the other way with a gesture up a large incline. We head into the village, stop at crossroads, where a woman darts into her home upon seeing us and well before Ali can ask her which way to go. Meanwhile, two elderly ladies hobble past, look sympathetically at me and my bike, hold their hands in the air towards the darkening sky and chatter agreeably away to each other. I guess they think I am mad. I feel quite mad as I attempt the leg buster 13% climb that takes us out of town and straight to the campsite. Here, we meet the very happy German couple we met 2172km earlier in Lagos. They are still unbelievably bubbly even though they had been caught by flooding in Portugal and told us that the campsite in Monte Gordo, where we had also stayed, was completely flooded. They had been stranded there and hotels in the area were pumping water out for 2 days. In hindsight, we had been very lucky. Today we should pass over the Pyrenees and into France. We are both looking forward to the change in culture; especially in terms of opening hours and food. Although the landscape only gradually transforms itself, there is an immediate change in attitude on the road. We are overtaken with a minimum of fuss, no incessant horn tooting and in general there is a much slower and calmer pace of driving. Road conditions are definitely no better, but hey you can't have everything your own way. Our biggest joy on the food side is we no longer have to worry about where to get bread from. In France, if there is nothing else, there are always delicious fresh baguettes to be found. The day begins with a 270 metre climb and although at the time I feet pretty good, it must have put a strain on me because for the rest of the trip, I am lagging behind Ali. This irritates him immensely. I just can't seem to get any power happening, even though I am pushing with all my might. Possibly the cramp I have been experiencing in my right leg might have something to do with it or the wind that forever pushes me all over the road but doesn't seem to bother Superman up front. His impression is that it is an easy 100km ride. Tempers are rather frayed when we enter the town of Sigean (104km; 626m) at around 4.30pm and we still need to find the campsite, do some shopping and get petrol. It is promising dark as I pick up supplies. We take a detour to get fuel at an Intermarche, but are disappointed to find it shut for no apparent reason. Thinking about the cold dinner as we follow the signs indicating 4 kilometres to the campsite. After this distance, we see another sign that indicates it's a further 2km. We continue quite anxiously along a busy road with our lights on as it is well and truly dusk. There is no more signage to head us in the right direction, but Ali luckily spots the words 'camping' on a wall in the distance and we turn off at the next round about. The reception is closed, even though a sign on the door says "open from 2-8pm". We pitch the tent in the only 'non-gravel' spot and next to a light, that we later discover doesn't work. That evening it stormed a gale outside and inside the tent. I felt so damned inadequate. Ali so extremely frustrated about me "going so slow". I'm afraid there's no answer to this dilemma. We both have to live with the fact that our strengths are different. He is always going to be stronger than me and I'm never going to be able to climb hills like he does. By the same token, it doesn't mean I am not trying. Yesterday the winds were north westerly while we were travelling north. It would have been nice if they had remained that way for today's journey. While we change direction and head South East, so does the wind. 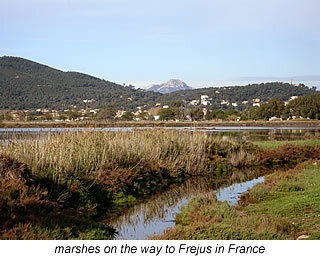 Despite this, the trip was relatively easy and very scenic; especially the route along the Canal du Midi. We meet a couple of Australians on bikes travelling in the other direction - Tula and Richard - Ali thinks it is David, but I'm sure it's Richard. Can you guys mail us to help clear up this little dispute? They have come from Greece, cycled through Italy and are now making their way towards Northern Spain. They tell us about a 90 kilometre bike path starting in Toulon and running along an old railway. It sounds so tempting that we later change our plans and head in that direction. We bid our goodbyes and further the cycle through winding one-way lanes lined with abandoned campsites and ghost town amusement parks. We wonder how these places survive on just a few months a year trade. The few people that we do meet are friendly and all greet us with cheerful 'bonjours'. The day was panning out very nicely indeed. Things take a turn for the worst after we s top at the tourist information in Agde (72km; 252m) and are directed to the only campsite open in the immediate area. Again, there is no-one at reception and the man, who appears to be the grounds-keeper has no interest in our aimless pedalling round and round the campground looking for someone in charge. I had noticed the €26 bundle charge on the sign before entering, but Ali had only seen the €4.50 per person fee. After returning from shopping, he confirms that it is the higher price and considering no-one is around and also considering the facilities are almost nonexistent, we plan to leave as early as possible the next morning. Rising at 6.30am in the pitch black, we are out the gates by first light and at 7.20am: there is still no-one in sight; reception is still closed, so we don't pay and we don't really care either. I guess you could call it a runner, but we are getting a little tired of paying outrageous amounts for no more than a small pitch and a shower. The campgrounds don't have any facilities open at this time in the season and they are often old and poorly maintained. About 10 kilometres out of town, we stop on the beach front to have breakfast and watch a big golden sunrise. It is a little on the cool side but the warm coffee helps combat that. Back on the bikes for another 1½-2 hour stint before breaking for food and a leg rest. The ride is pretty easy today; flat and picturesque along an initial stretch of coast followed by vineyards and olive groves. We pass by Montpellier Airport just as a plane is landing, which gets Ali all excited. We stop at a Decathlon store to see if they have anything we need - which gets me excited. They don't, which is disappointing. The wind picks up in the afternoon and by evening at Aimargues (94km; 186m) it is really blowing a storm. I was awoken on several occasions due to the tent blowing left, right and centre. Even as safe as we feel in our Helsport tent, we are still woken with the tent blowing every which way. The last time we were in the Camargue National Park we faced the mistral. This time we face winds that are just as strong. The whole day we push against a bluster that has me flying all over the road. Even Ali is doing a little side dance at times. The Camargue is just as beautiful as I remember though: rice paddies, vines and an abundance of wildlife all around. Golden colours of Autumn surrounded by luscious green grass is more stunning than any photograph could relay and it helps keep my mind off the howling gale. Straight roads leading towards the campsite in the late afternoon are a little harder to bear since the scenery drops off until we hit the lake Etang de Berre. The receptionist at the St Chamas (93km; 291m) campground speaks several languages, which keeps Ali entertained for a while. I on the other hand, am happy to sit relieved of our arrival and rest my aching knees. Today is one of the most scenic rides of our tour yet; putting France way up there as far as cycle touring is concerned. The more I see of this country, the more I fall in love with it. We have a lot of climbing to do, but with every steep passage comes a magnificent view and then a lightning drop into a colourful valley below. We wind our way through farms full of vines and then pass through Arles. Ali is just as inspired by the beauty as Vincent van Gogh portrays in his paintings; he keeps commenting on the dappled plain tree colours lining the streets. The weather is on also our side, with the sun shining often enough to keep us warm. Our jackets are still hurriedly zipped up as we drop down the side of a mountains, but just as quickly opened on the way back up. After such a good day's workout, it's unanimous by the tent at Six Fours Les Plages (109km; 1127m) that a couple of days rest are due before the next stage: from here to Lucca in Italy. We spend three nights in Six Fours les Plages. The campsite is nothing special with its 17 euro fee excluding tax; but there is plenty of green grass, a good light next to our tent, pressurized hot water, shopping facilities close by and free internet outside the Intermarche. We also tap into the electricity supply in order to get everything ready for the end of month update. On this note, we have to say to all our regular readers that we are sorry if the updating seems a little spasmodic. Firstly, most of our day is taken up with cycling and trying to find somewhere to camp. It is usually dark by the time we have set the tent up and so we tend to stick put and not venture much further than the toilet block. Secondly, it's a lot harder than you think to find internet access out of tourist season and especially when you are travelling through tiny villages in both Spain and France. As we head towards Asia, we are hopping that we won't have the same difficulty as we have had in Europe, with tracking down an internet cafe. Admittedly this month, there was probably a slight chance of an update in Barcelona, if we had pushed it. However, changing the Thermarest mattress and stocking up on bike supplies at Bike-Tech took up much of the time available before the Spanish break for their siesta each day. As soon as the shops open again, it is pitch black and quite honestly, I would rather be relaxing by my tent at that time of day. Ali had dropped into the Tourist Office the day before, picked up a cycle route map and we are all set to follow this path from Toulon all the way through to Frejus - just north of St Tropez. Well at least, that's what we thought. The path from the campsite to Toulon is reasonable enough, although they are still building it, which means it doesn't always join up and you still have to ride on and cross some most precarious bits of road. Coming into Toulon is great: pedalling along the highway on your own little highway. In the city centre itself, it became a little confusing, but after a few stops and the power of deduction we managed our way out. Most of the route from here on is along the original highway and now a service road. Just hang on to your handle bar and be prepared to swing around the holes. We soon find ourselves on some super bike paths; quite similar to those in Luxemburg. We are lead through suburbia; green forests and back into suburbia again. The day had started out with us hauled up in the tent waiting for the rain to stop, but now there are blue skies and a warm sun turning the moment into really excellent cycling. France shows us yet again some of her radiance and natural beauty. With regard to the cycle track though; while there is technically 90 kilometres of cycle paths, but they are not yet a complete network. According to the tourist pamphlet there will eventually be a 102km stretch leading from Toulon to St Raphael, which will be an amazing ride for all cyclists great and small. Can't wait to get back there one day to try it out. We did find the section that Tula and Richard told us about. Built on the old train track makes it a real buzz darting up and down the hillside, through gorges and tunnels. After St Clair however, when you start to enter a town or cycle along a boulevard that you feel you have enough space to pedal comfortably. Luckily, the roads aren't too busy until late afternoon. The section between St Clair and La Croix-Valmer is undulating coastline with almost no shoulder. The views are definitely spectacular. We then descend and move along the coast to St Maxime where we can clearly see how the other half lives across the bay in St Tropez. By this stage we still have 20 kilometres - or at least that is what our map tells us - to do and it is already 3.45pm. In an hour it will be dark, so with no real break we are back on the bikes. We arrive in Frejus at 4.45pm and it is really time to put the lights on. there is a bit of difficultly finding our way out of the city and to the campground. A passerby informs us that we still need to do 10 kilometres before reaching our destination and he isn't far wrong. After a short shop at a convenience store, we pedal in at 6.00 pm Frejus (126km; 674m). A very enthusiastic French woman welcomes us warmly and then leads us around the campsite in her golf buggy, adamant that we find just the right spot. I guess she took a bit of pity on us, seeing as it was freezing cold, completely black and we both looked worn out. I remember very little except the delicious dinner of lemon and honey buttered vegetables with local basmati rice and crawling into my sleeping bag fully clothed, after reluctantly facing the cold, damp air to clean my teeth. Today is still very damp and well below 10° Celcius. It confirms that I'm not a cold climate person. Over a breakfast of baguettes with cheese, chocolate spread and strawberry jam, filtered coffee and peach-orange juice, Ali confirms that the clothes are wetter this morning than when we put them on the line last night. Not a good sign. We pack up and leave quite late at 9.30am, striking a climb within a few minutes of riding. I get off and push for the last bit, which I haven't done since the initial two weeks of the trip. Superman of course surges on up the 311 metre incline and reaches the top well before I do. It was an hours steady ascend at an average gradient of 4%. For the entire climb, vast bush land valleys below make us seem so small in comparison. The sun finally pushes through a little before 12 midday and by that stage we are well and truly ripping down the mountainside. I first stop to pick some wild thyme which is abundant in this region and then further break at Mandelieu in one of those giant shopping traps and I engulfs for 35 minutes. I submerge to face a rather impatient husband outside. Ali still isn't quite sure where the campground is and we follow our noses into and just a kilometre out of La Roquette sur Siagne (38km; 459m). Two in the afternoon is a very early arrival for us and it should be enough time to get this month's writing ready for updating tomorrow. But I'm learning fast, not to promise anything: you just never know what might happen. One thing is for certain though and that December 1 marks five months of cycle touring for us. We will celebrate entering our 6 month on the road with a zigzag through Nice along the coastal road, passing into Monaco and then out again to find ourselves in Italy. That's three countries in one day, so I guess we can safely say, we really don't know what will happen.